Ethereal beings have always had special meaning to me. They represent something divine, something untouchable but magnificent and magical in this universe. I’ve collected sun mirrors or ‘sunburst’ mirrors – round mirrors surrounded by gold-painted wood ‘rays’ – for severals. They’re (somewhat) easily found in flea markets in France, Belgium and occasionally, northern Germany, though they’re much harder to be found in the U.S. So I was thrilled that this year’s theme for the San Francisco Fall Art & Antiques show features such pieces prominently: The Sun, The Moon & The Stars: Celestial Imagery in Art, Antiques & Design. Tomorrow night’s opening night gala kicks off the 37th annual SF Fall Art & Antiques Show, followed by three full days open to the public. And I got a sneak peak of some of the fabulous works of art that are up for sale. Though the show features a wide range of objects – furniture, decorative objects, paintings, prints, photographs, books, gold, silver and precious metals, jewelry, rugs, textiles and ceramics – from 50 deals from around the world, I chose to highlight just two of my favorites here. Pictured at the top of this post is a set of 3 (rare to find) French Art Deco Starburst Mirrors from France in the 1930s. They’re simply luminous, as befits an object replicating the sun! They’re available from Milford Antiques and will be on display at the show (until they’re gone!). Gazing below, what do you think of this beauty? 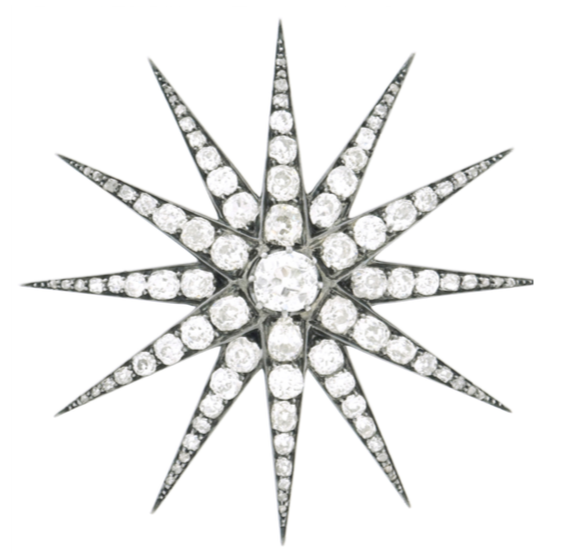 A precursor to Chanel’s modern take on les étoiles centuries later? This gorgeous Victorian diamond brooch is featured by the dealer Lawrence Jeffrey, who specializes in antique and estate jewelry. Even if you’re not in the market for such an extravagance, do stop and have a look at it! 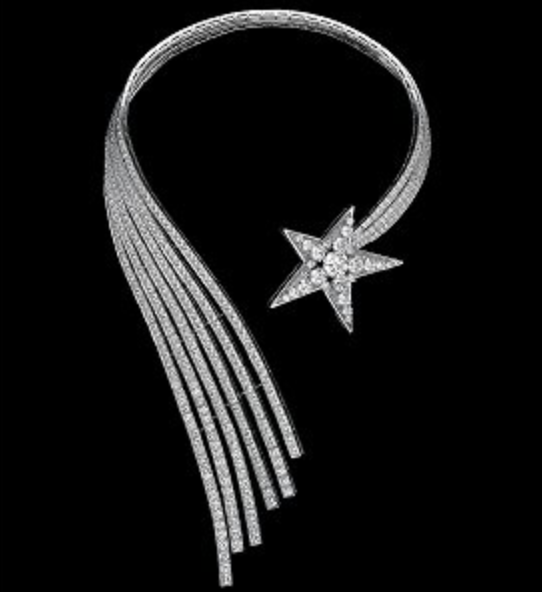 And an example from Chanel’s High Jewelry collection, “Les Étoiles” from the early 2010’s. A very memorable collection. It proves the point that celestial images have inspired artisans for centuries. The 2018 San Francisco Fall Art & Antiques Show runs from Opening Night October 11-14 at Fort Mason Center for Arts & Culture’s Festival Pavilion. For more information and tickets, go to www.sffas.org.